The Salzburger Haus der Natur is just south of the St. Blasius Church off Anton-Neumayr-Platz and expands along the Salzach river into to former Ursulinenkloster by St. Markus Church. It is an extensive Natural History Museum with an emphasis on local and regional aspects, but a wide range of exhibitions. Much like the old Salzburger Museum Carolino Augusteum, the Haus der Natur was somewhat old-fashioned until extensive modernisations took place over recent years. You can still sense the spirit of 1960ies dioramas in some corners, but over-all, the Haus der Natur today is a modern institution with an exciting range of topics presented in state-of-the-art panels. Among the highlights are the aquariums, considered to be among the best in Central Europe - which, admittedly, doesn′t mean too much. However, they are indeed well maintained and among biologists, the Haus der Natur is famous for its collection of Mediterranean species and tropical corals. A 10,000 litre tank with seawater accommodates sharks that are fed every Monday at 10.30 am, just in case you are very much into sharks. The other section with living rather than stuffed animals is the reptile zoo, with a large collection of snakes, lizards and amphibians. A lot of the exhibition seems to be a little out of place for a Natural History Museum, dealing with technology and space exploration - but in any case, they are good fun especially for children, so don′t grumble about it. More natural are the sections on geology and earth sciences, with lots of local references and a display of some stunningly massive gems that were found in the mountains South of Salzburg. The new hands-on section in the former CA Museum building allows kids to do experiments for science and enigneering questions themselves. 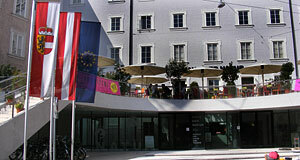 The Haus der Natur is a decent museum and one of Austria′s best, although not among the best of Europe. If you have spare time, if you are interested in Natural History or if it rains really hard, it is certainly a worthwhile destination. However, keep in mind that it′s not too Salzburg specific, so as an outside visitor you might want to look for places more genuinely Salzburgian.